This early outstanding large 9 7/8” dinner plate is transfer printed in dark chocolate brown. 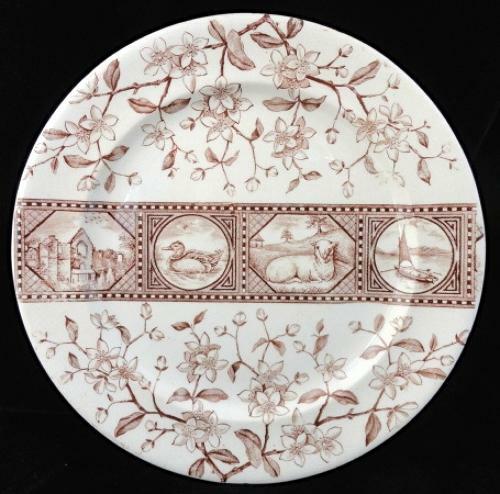 Capturing the Victorian love of nature, this plate is transfer printed with cherry blossoms surrounding a series of cartouches featuring a wood duck, lamb in a pasture, sailboat, and gothic ruins. One of the very best of the aesthetic movement patterns. The condition of this delightful plate is great. No chips, cracks or repairs. Normal stilt marks to the outer rim.